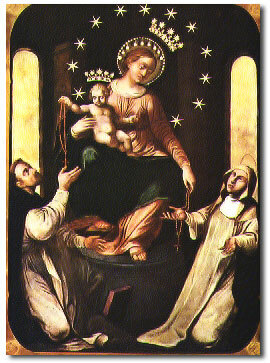 The "54-day Rosary Novena" is an uninterrupted series of Rosaries in honor of Our Lady, revelead to the incurably sick Fortuna Agrelli by Our Lady of Pompeii at Naples in 1884. For thirteen months Fortuna Agrelli had endured dreadful sufferings and torturous cramps; she had been given up by the most celebrated physicians. On February 16, 1884, the afflicted girl and her relatives commenced a novena of Rosaries. The Queen of the Holy Rosary favored her with an apparition on March 3rd. Mary, sitting upon a high throne, surrounded by luminous figures, held the divine Child on her lap, and in her hand a Rosary. The Virgin Mother and the holy Infant were clad in gold-embroidered garments. They were accompanied by St. Dominic and St. Catherine of Siena. The throne was profusely decorated with flowers; the beauty of Our Lady was marvelous. Blessed Virgin said: "Child, thou has invoked me by various titles and hast always obtained favors from me. Now, since thou hast called me by that title so pleasing to me, 'Queen of the Holy Rosary,' I can no longer refuse the favor thou dost petition; for this name is most precious and dear to me. Make three novenas, and thou shalt obtain all." Once more the Queen of the Holy Rosary appeared to her and said, " Whoever desires to obtain favors from me should make three novenas of the prayers of the Rosary, and three novenas in thanksgiving." The Novena consists of five decades of the Rosary each day for twenty-seven days in petition; then immediately five decades each day for twenty-seven days in thanksgiving, whether or not the request has been granted.The meditations vary from day to day. Now with the new mysteries the table is changed. On the first day meditate on the Joyful Mysteries; on the second day the Light Mysteries; on the third day the sorrowful Mysteries; on the fourth day meditate again on the glorious Mysteries; and so on throughout the fifty-four days. Should you not obtain the favor you seek, be assured that the Rosary Queen, who knows what each one stands most in need of, has heard your prayer. You will not have prayed in vain. No prayer ever went unheard. And Our Blessed Lady has never been known to fail. 54-day novena rosary prayer very powerful! Indeed I would like to share my part of the story. I prayed the 54-day novena rosary prayer for the first time in October 1999. By that time I applied for a job in another town and rumor leaked out that I won the position. By then I had two children. I took them out of school where we lived and enrolled them in the town where we were supposed to lived. To make a long story short. I did not get the position but my children were already schooling in the new town and I was in distress. I was smoking too. That month of October I prayed the rosary very seriously as requested on how the prayer was done. On the 4th day of the 54 day prayer I nearly fainted in my bathroom and that was the last day of me smoking. On the first day of November my boss asked me to go and help out at the head office which was the same town where I wanted to go and work and where my children were schooling. I went for four months and was given a subsistence allowance apart from my monthly salary. On the fourth month there was an opening at the head office and I immediately applied for a transfer. Which was given to me. In the end I only had to take the car back that I was given to use during my stay where I came from. Mother Mary was great help. If it was not for her intervention I would have struggled a lot. I have many, many stories and testimonies and I am willing to share them if it will encourage even one person.